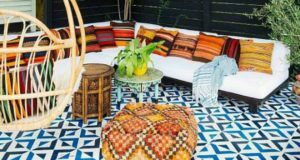 June signifies many exciting possibilities for us – school is out and vacations are on top of the mind, home projects begin in earnest and anxious gardeners are crowding the markets to purchase annuals, perennials and vegetable plants. 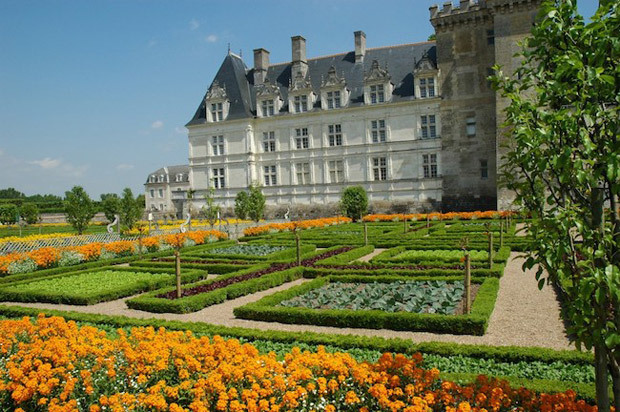 Since we are celebrating all things French during June, a special visual treat for all you gardeners from Chateau de Villandry is in order. 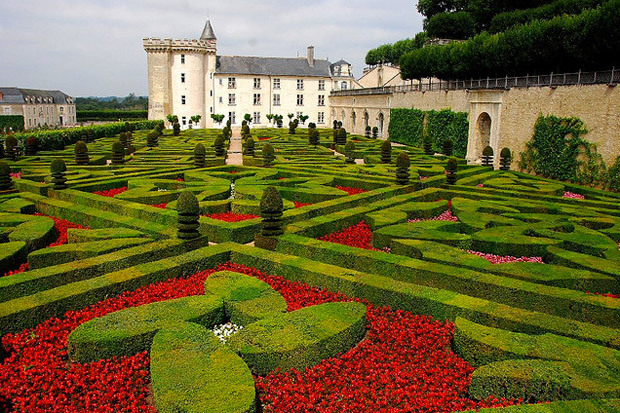 The French formal garden style is symmetrical and intended to impose order over nature, quite different from the romantic country gardens found in England. 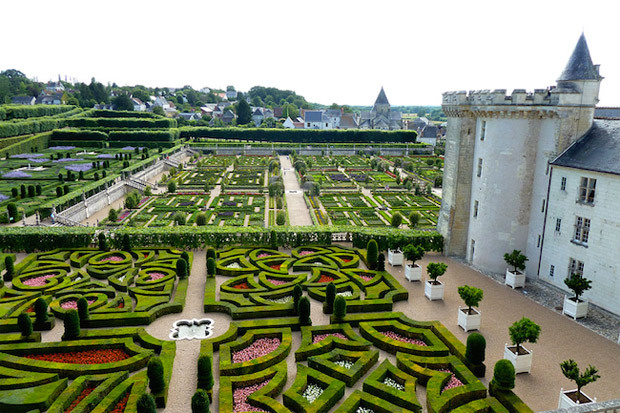 Widely copied by the courts of Europe, formal gardens were wildly popular in the 17th century, beginning with the Gardens of Versailles designed for Louis XIV. Must-have elements included a geometric plan, a terrace overlooking the garden so it could be seen in its entirety, and vegetation constrained to demonstrate the mastery of man over nature. Trees were planted in straight lines and trimmed and topped to a certain height. 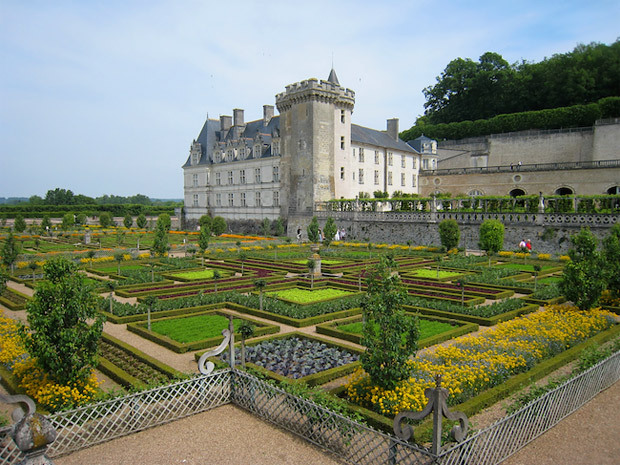 Clearly the residence was the central ornament, with no trees planted close to it, instead featuring low parterres (planting beds) and ornately trimmed bushes. Bodies of water like canals and basins served as mirrors to increase the visual size of the house. Sculptures based on mythological figures marked axes to punctuate intersections. Very specific and ornate, wouldn’t you agree? Pattern and more pattern in a colorful array everywhere. But what about the flowers you may be wondering. Apparently back in the 17th century the flowers were available only in certain specific colors like blue, pink, white and mauve. 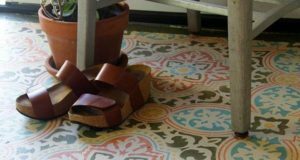 Brighter colors arrived later in the 1730s due to the discoveries of exotic species made around the world like tulip bulbs from the Netherlands and Turkey. 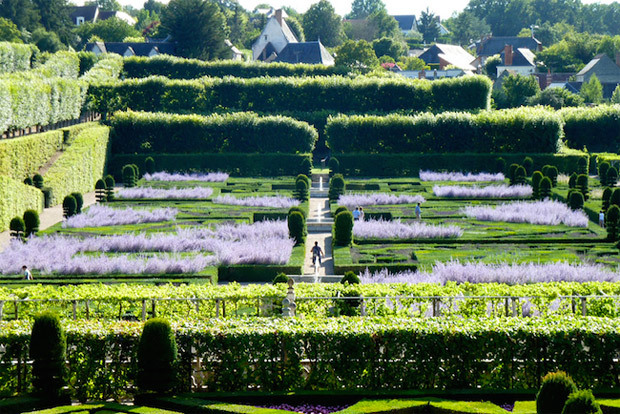 French garden designers considered architecture as the basis of their design. The gardens were a mere extension of the residence, with geometry and perspective being its crucial elements. 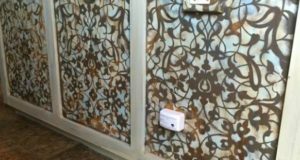 “Rooms” were created around established walking routes. 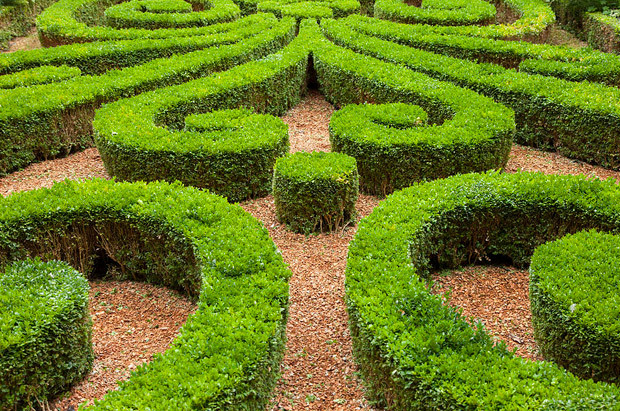 Hedges created walls and waterways symbolized stairways. Carpets were comprised of grass, trees became alleys while fountains imitated water pouring into carafes. Beyond spectacular eye candy, the gardens were used as settings for plays, fireworks, and concerts. Unbelievably, full-size ships were constructed to sail on the garden canal at Versailles for Louis XIV. 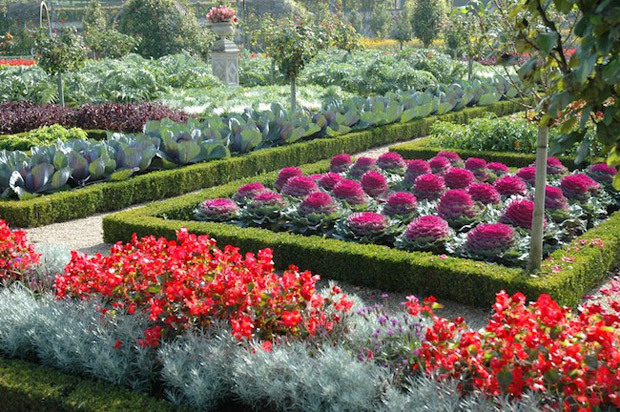 Not just for beauty and order alone, large sections of the garden comprised the potager, the vegetable or kitchen garden. In the Medieval times, these gardens were tended by monks and nuns to provide food for the residents of the abbeys and flowers for the altars. No scraggly rows of tomato plants and radishes were found here. 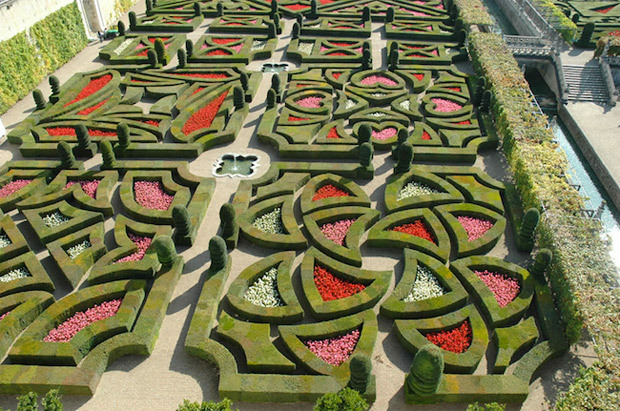 Massive organic tapestries, gardens such as these grew increasingly elaborate and ambitious. Eventually, the garden was no longer a mere decoration for the residence. 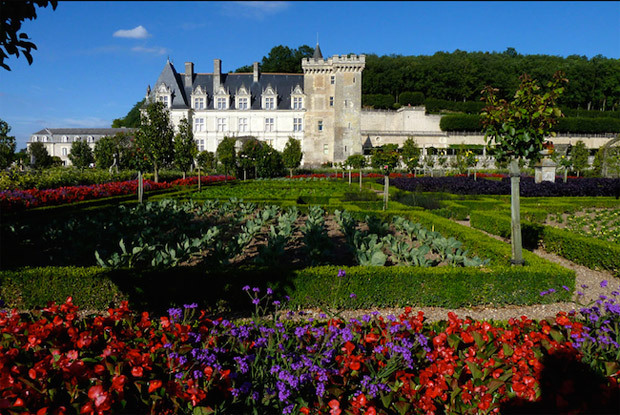 On the contrary, the chateau served as decoration for the garden. So how do your gardens stack up? Just kidding. 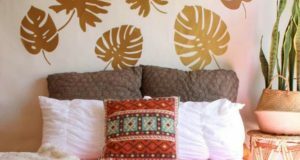 But if you are inspired by French design, be sure to follow Paint+Pattern all month for DIY projects full of both color and pattern, and perhaps some slightly decadent gilding too! My name is Keith Bansh and I’m currently doing my Masters in Landscape Architecture in England. I am writing a non-profit student paper entitled ‘Music in the Landscape’ and would like to request copyrights for a particular image in your website. 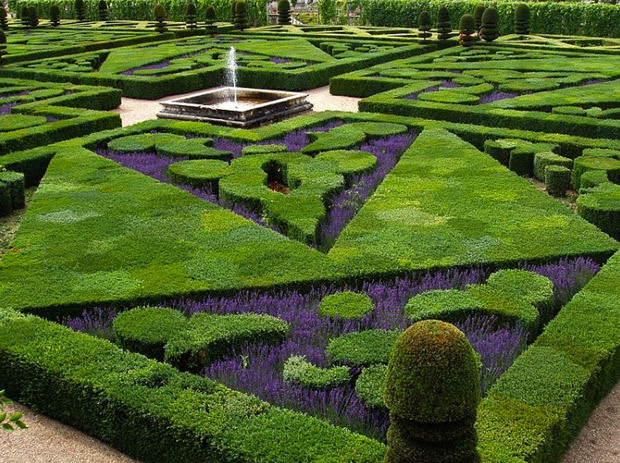 It is the 3rd image from the top of your article ‘The Fantastic Designs of the French Formal Garden’. Magnificent goods from you, man. I’ve understandyour stuff previous to and you’re just extremely wonderful.I actually like what you have acquired here, really like what you’re stating and the way in whichyou say it. You make it entertaining and you still care for to keep it smart.I can not wait to read far more from you. This is really a terrific website. Hi there, i read your blog from time to time and iown a similar one and i was just curious if you get a lot of spam remarks?If so how do you stop it, any plugin or anything you can advise?I get so much lately it’s driving me mad so any support is very much appreciated.